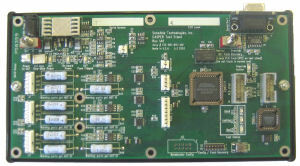 Dual Blackfin BF561 Digital Signal Processor (DSP). 8Mbytes Flash Memory, and 4Mbytes SDRAM. 1.5Msps 14-bit A/D converter, with programmable gain front-end. Bolton Engineering worked with Innov-X to create a specification, designed the schematics and circuit board, wrote test and driver firmware, wrote USB mass storage driver software, fabricated and debugged the hardware. Innov-X was responsible for all mechanical and industrial design, and wrote PC-resident software. The first-pass boards worked and fit perfectly without requiring changes. 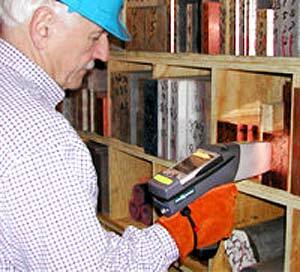 Innov-X produces a line of Handheld X-Ray Fluorescence Metal Analyzers that are used to determine the metal content at scrap yards, in mining, and in other metrology applications. Each system consists of an HP iPaq PDA that performs the spectral analysis and displays the results, and a custom data acquisition and processing card that samples and consolidates detector data. The Innov-X Acquisition Engine had interfaced to the iPaq PDAs using a serial interface, but suddenly HP had announced that new models would replace the serial ports with USB ports. Innov-X turned to Bolton Engineering to rapidly produce a new design that was form-compatible with their original board, but would incorporate a high speed (480Mbps) USB port. In addition, Innov-X wanted to add an interface to a VGA-size CMOS camera module to allow future products to store a picture when taking a sample.